It wasn't Hollywood but Richard Browning's bid to make world history was straight out of a superhero film. 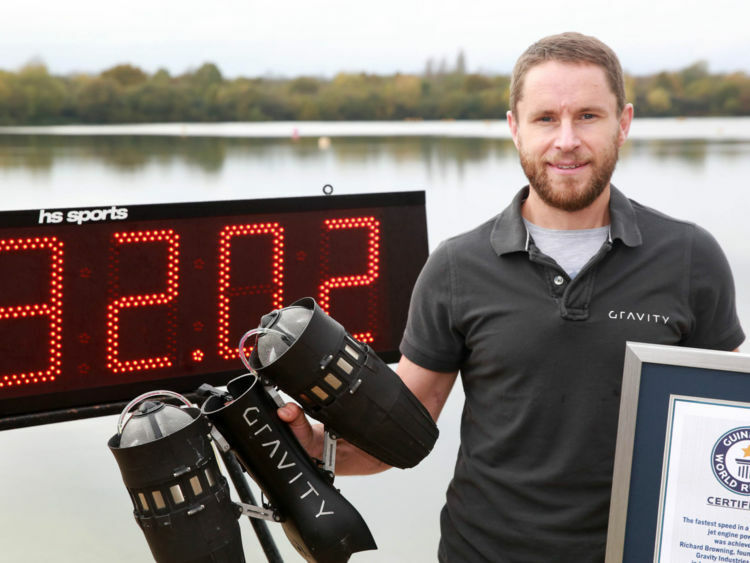 Browning set a Guinness World Record for the fastest speed in a body-controlled jet engine power suit this week.The founder and chief test pilot of British tech company Gravity Industries reached a speed of 32.02mph on his third attempt at Lagoona Park in Reading.Then he mis-timed a turn and dropped into the lake.It mattered little by then, however, as he had already made history.Adjudicator Pravin Patel from Guinness World Records was on hand to make sure that Browning's speed was measured accurately over at least 100 metres.The "Iron Man" suit is made up of six kerosene-fuelled micro gas turbines, which each have 22kg of thrust.It is controlled solely by body movement so Browning had to practice core strength exercises before his record attempt so he was able to balance in the air. Mr Browning told Reuters: "It's a very special moment every time we suit up, it's about 45 kilos so you really know your'e about to go and do something. "As the engine starts fuelling up it starts to build, you can sense the energy. "And the moment the ground leaves your feet and you're actually in the air, it's a pleasure and a joy. "Mr Browning's feat came as scores of other records were smashed as part of Guinness World Record Day.In the US, a Harlem Globetrotters player broke the record for the highest upward basketball shot - 15.26m or 50ft.And extreme gymnasts Giuliano and Fabio Anastasini did the most Risely flips in 30 seconds.The largest vegan cake was made in Sweden and the largest hula hoops were spun in Japan.Mr Browning's achievement has been a long time in the making and Sky News has followed his progress from training on a Salisbury farm to unveiling his invention in front of crowds in Canada.